Morphou is located in the northwest side of Cyprus, 30 miles from Nicosia. In 1974 Morphou was invaded by the Turkish troops, who forced its residents away, and since then keep the town under their occupation, forbidding the Greek Cypriots from visiting their houses, their orchards, their churches, and the soil that buries their ancestors. The Church of Saint Mamas is one of the most important Franco-Byzantine churches in Cyprus, and dates to the beginning of the 16th century. It was built on the ruins of two ancient Christian basilicas, and one Byzantine church. Two festivals were celebrated for St. Mamas, one on September 2, and the other on Palm Sunday. For years Orthodox faithful have been trying to hold services in the Church of St. Mamas in Morphou, yet without success. In 2004 they were finally allowed to hold services. Morphou is expected to be returned to Greek control in a future settlement between Greeks and Turks – indeed, even the 2004 Annan plan envisaged its return. Today at the Kato Pyrgos-Limnitis checkpoint the Turkish occupation regime refused to allow 650 Cypriot Orthodox pilgrims from the Tylliria and Paphos districts to cross into occupied Morphou and attend services at the Monastery of Saint Mamas, whose feast day is today. The Cypriot government thought it had an agreement with the Turkish side that if it allowed Turks living in occupied Cyprus to cross without checks to the Turkish Cypriot enclave of Kokkina to commemorate the battle that took place there in 1964 (in which Turkish aircraft strafed and dropped napalm on Greek villages to prevent Cypriot forces from overrunning the terrorist TMT stronghold of Kokkina), then Greek Cypriot pilgrims would be allowed, on the same terms, to enter occupied Morphou and attend the St Mamas celebrations. The Turks made their trip to Kokkina, on 14 August, unimpeded and, up until yesterday, and despite rumours to the contrary, the Christofias government was insisting that the occupation authorities would allow the Morphou crossing to take place without the pilgrims being forced to go through rigourous ID checks. However, today, as soon as the pilgrims crossed into the occupied areas, the buses in which they were travelling were halted by 'police' from the occupation regime, who proceeded to board the buses and carry out stringent Kafkaesque ID checks, taking several people off the vehicles and declaring they would not be allowed to cross. 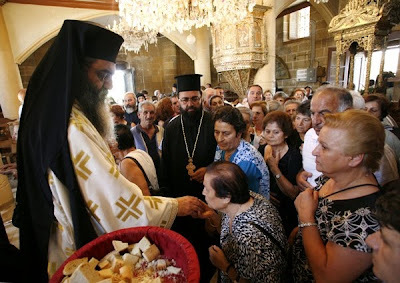 After three hours of harassment and calculated humiliation – during which time the services at St Mamas had finished – the Greek Cypriot pilgrims felt obliged to abandon the pilgrimage and return to the free areas. The history of Greek-Turkish relations since 1922 tells us that any agreement the Turks enter into is not worth the paper its written on. For the Turks, an agreement is merely a means to an end, which will be discarded the moment it no longer serves Turkey's purpose. Thus, it was entirely predictable that the 'agreement' reached over Kokkina and St Mamas would not be adhered to and that the 'assurances' given to the Cypriot government were meaningless. This raises Papadopoulos' question during the debate over the Annan plan: how can the Greek side be sure that Turkey will abide by any commitments it enters into? In fact, it was this question that President Christofias claimed was the deal-breaker for him over Annan, i.e. he was not convinced that the plan provided the mechanisms to ensure Turkey would do what it agreed to do and not even last-minute phone calls from US secretary of state Colin Powell to Christofias assuring him that the USA would insist Turkey honour its commitments managed to persuade Christofias to change his mind. The Papadopoulos question, therefore, remains of paramount importance. If the Turks cannot be trusted to keep to an agreement on the simple matter of a religious pilgrimage, then how can we expect the Turks to fulfill any obligations it enters into on matters of much greater significance, such as the withdrawal of Turkish troops and settlers from Cyprus, the return of territory and so on? 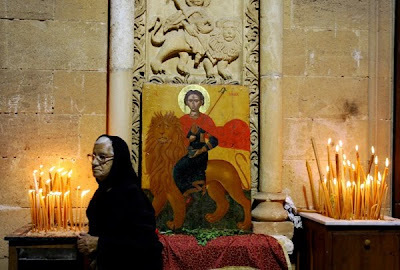 Saint Mamas, although he was not a Cypriot local saint, was venerated greatly in Cyprus, especially in the Morphou area. He was from Gaggra of Paflagonia in Cappadocia and was born in prison during 260 A.D. where his Christian parents were held and who ultimately became martyrs during the Roman persecutions. He was given to a good woman, by the name of Ammia, in order to bring him up and it is said that the saint used to call her "mama" (mommy) and thats why he was named Mamas. He died in 275 A.D. at the age of 15 after going through much torture for the faith. 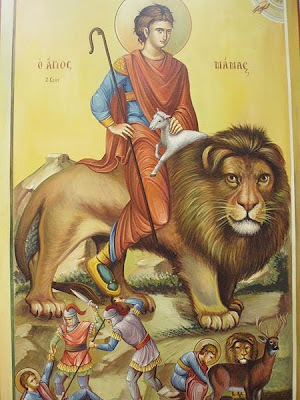 Saint Mamas was the patron saint of the acritic army unit of the Mardaites Τhieves (Apelatai) during Byzantine times. A sub-unit of the Mardaites who came to Cyprus and settled in the area of Morphou introduced the veneration of their patron to Cyprus. Originally a church was built baring his name and later it was replaced by the monastery of the same name in the occupied town of Morphou. It is one of the most important churches of Cyprus, of Franco-Byzantine style, and dates from the early 16th century. The sarcophagus of Saint Mamas is found in a niche situated on the north wall of the church, and has relief decoration. According to a tradition, the remains of the Saint arrived in Cyprus in a sarcophagus, which survives today in the church, from the shores of Asia Minor. The iconostasis was made in the 16th century and during 1945 new buildings were constructed west of the church in which the Bishop of Kyrenia used to reside. Major changes, additions and improvements were made in 1963 and these included a lecture hall, library, etc. In 1973 Morphou acquired its own Bishopric for the first time in its history having as its first Bishop Mr Chrysanthos Sarrigiannis (1973-1996). Today the Bishop of Morphou is Mr Neophytos and the Cathedral church of the Bishopric is that of Saint Mamas. After the Turkish invasion, the Church of Saint Mamas in Morphou was converted into a museum. That's why today it is in good condition. Before the Turkish invasion two festivals used to take place at the monastery, one on September 2 (feast day of Saint Mamas) and one on Palm Sunday. At 10:00 AM the Divine Liturgy for the Feast of St. Mamas took place amidst hundreds of faithful who were able to enter through other barricades. 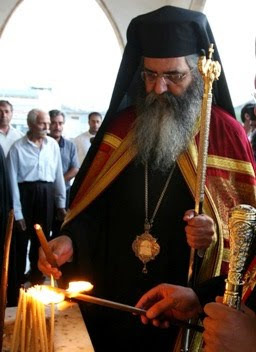 The Metropolitan of Morphou Neophytos was the celebrant. In his sermon it was his wish that next year all Orthodox Cypriots would be able to celebrate the feast unhindered. Pictures of the service are below.